2.1 How Does Fluidization Take Place? 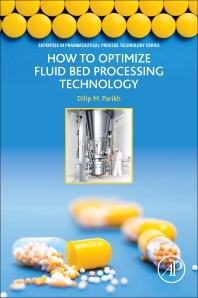 How to Optimize Fluid Bed Processing Technology: Part of the Expertise in Pharmaceutical Process Technology Series addresses the important components of fluid bed granulation, providing answers to problems that commonly arise and using numerous practical examples and case studies as reference. This book covers the theoretical concepts involved in fluidization, also providing a description of the choice and functionality of equipment. Additional chapters feature key aspects of the technology, including formulation requirements, process variables, process scale-up, troubleshooting, new development, safety, and process evaluation. Given its discussion of theoretical principles and practical solutions, this is a go-to resource for all those scientists and new researchers working with fluid bed granulation as a unit operation. This book provides comprehensive information and how to help on various aspects of fluid bed processing technologies. Dilip M. Parikh is president of the pharmaceutical technology consulting group DPharma Group Inc. in the USA. As an industrial pharmacist, Parikh has more than 40 years of industrial experience in solid dosage technologies, cGMP complaint facility planning, process engineering and manufacturing and operational management at various major pharmaceutical companies in Canada and the U.S. Prior to starting DPharma Group, he held the position of vice president of operations and technology at Synthon Pharmaceuticals in North Carolina and vice president and general manager at Atlantic Pharmaceuticals Services in Maryland. He has authored several book chapters and articles on various pharmaceutical technologies, including quality by design, continuous manufacturing, process optimization and contract manufacturing. He has been an invited speaker at scientific conferences worldwide on solid-dosage technologies development and manufacturing.